It’s been a busy week around here and the fact that it’s April is blowing my mind. The next week say temperatures near 80 are possible and I’m already adding sunscreen and life jackets to my ‘need to buy’ list. Anyone have any infant/1 year old life jacket recommendations? 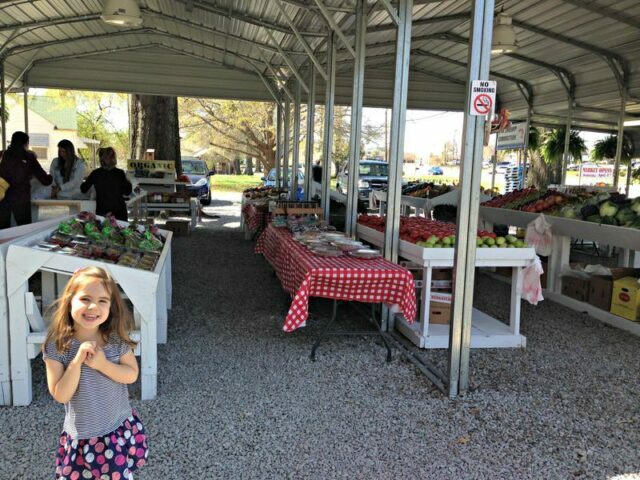 Other sure signs that winter is truly behind us includes the opening of Josh’s Farmers Market. We’re pretty excited about this. Me for the fresh produce and Hailey for the honey sticks. That above smile is 100% pure honey stick anticipation. In other news, after bumming two new SCOBYS off my friend, I finally managed a fresh and fizzy batch of homemade kombucha. I’m experimenting turning one into a ginger variety. Pretty wild times around here. Yesterday was a full morning. 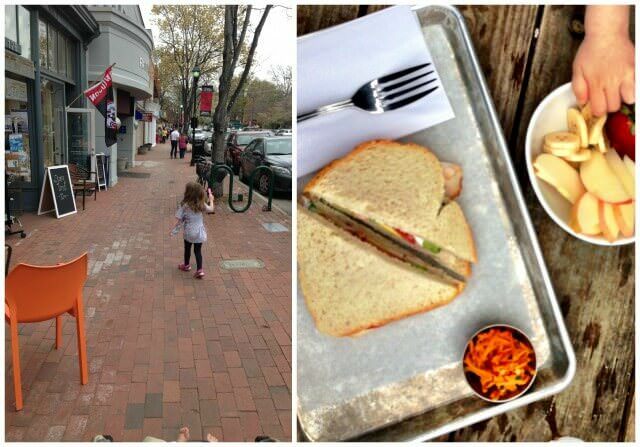 Koda and Kaitlyn both had doctor appointments and the girls and I ended up on a playground in Davidson and grabbing lunch at The Pickled Peach, which again proved to be incredible. Locals, it’s a must try! Koda had a long treatment yesterday that wore her out, so when the girls napped, Koda and I cuddled up to do the same. 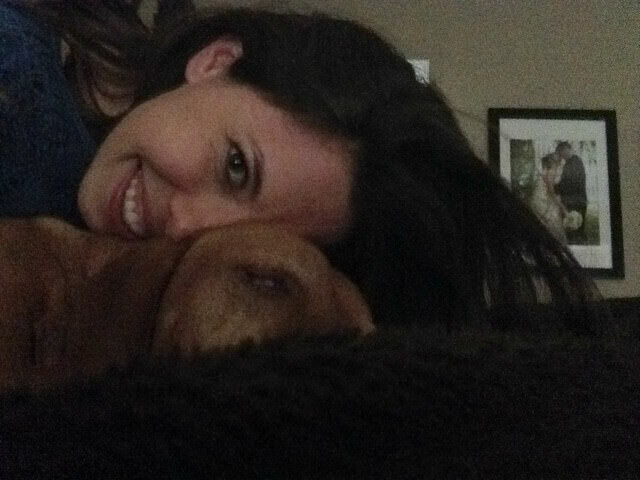 My friend Alison and her girls came over, which made the afternoon fly by with some chitchat (love me some play dates!) and then we managed a family dinner with all four of us, which is rare. Kaitlyn went to town on some sauteed mushrooms. Get that vitamin D girl! Once the girls went down, I left the house (rare occurrence!) 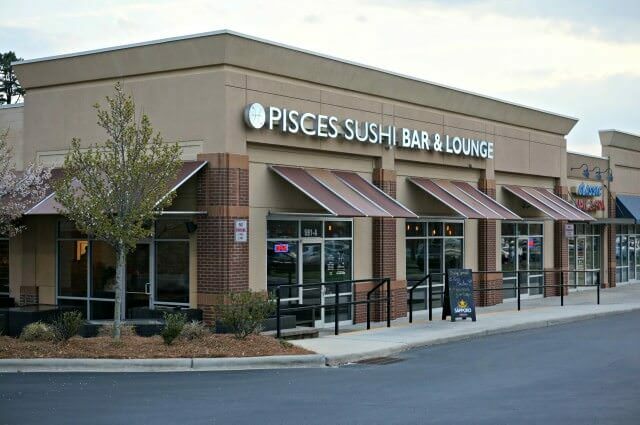 to meet my friend Kelly at a new spot in Mooresville, Pisces. They fly all their fish in weekly from the New York Fish Market, plus they have half-priced martinis on Thursdays. 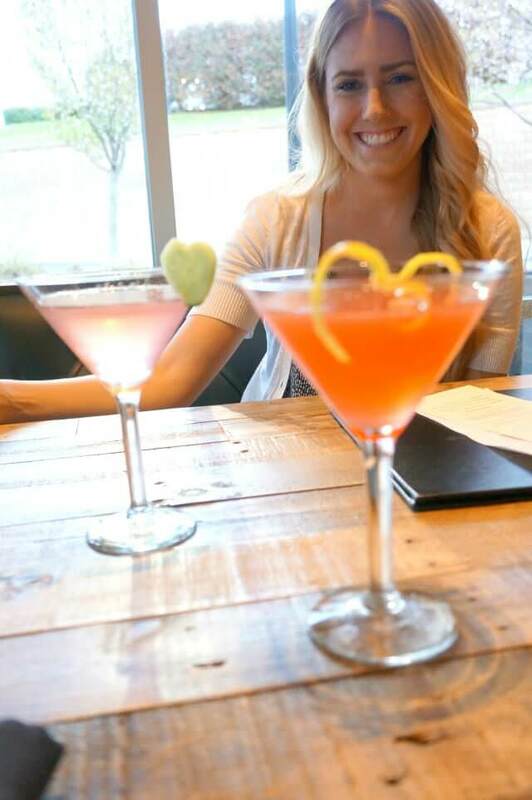 Kelly and I each picked incredibly girly versions to sip on. And a second dinner because rainbow rolls always entice me. I swore I had more (incredibly deep) thoughts to share, but Kaitlyn woke up early and has been especially smiley and cuddly, so I’m going to go soak that up a bit. I hope you all have a great Easter weekend! Do you have a favorite sushi order? 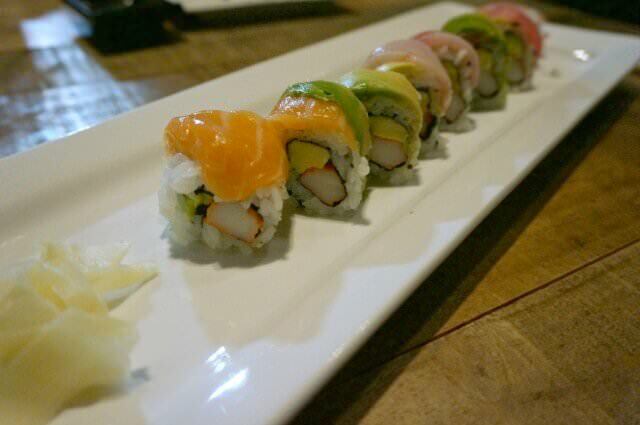 I love Rainbow Rolls and the classic, California, of course! YUMMMMM, i love sushi. Blazing California is my favorite. 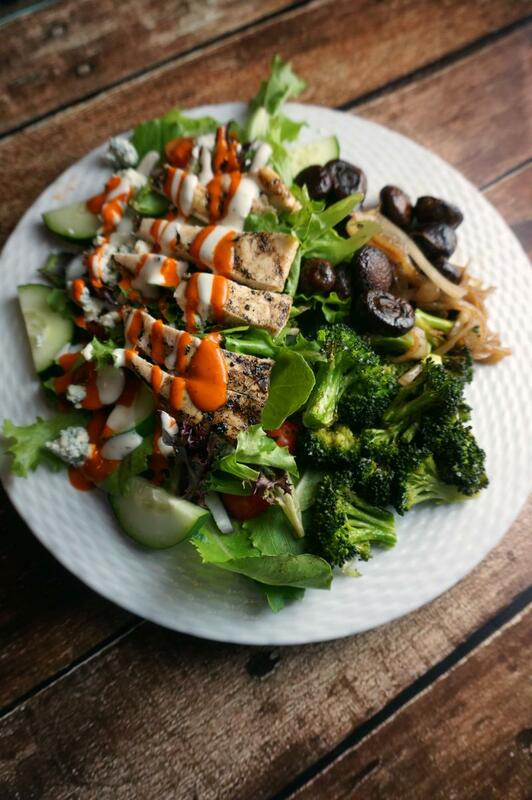 Oh and those fresh veggies look amazing. It will be at least 2 more months maybe even three until we have farmers markets here in WI. Mad mango-Cado roll from Eez sliced thin bc ow I Can’t fit the pieces in my mouth…. ( mango, shrimp, avocado, amazing sauce…) perfection. Still don’t understand why you eat “bait”, (sushi)! The other food looks delicious! (including the liquid in that colorful glass in front of Kelly! John J. recently posted..Stop Blaming: It Doesn’t Work!! Mmmm, delicious overpriced bait!! It’s so good!! 😉 Love you dad! Ha! That picture of Kaitlyn is hilarious. I’m mostly veg, so my favorite sushi rolls usually have something to do with avocado, tofu, and/or cream cheese (which I am sure is about as far as you can get from traditional sushi!). Jen recently posted..5 Years Ago This Situation Would Have Guaranteed Binge Eating. Not Anymore. we live on our 41′ boat about 30% of the time. Both our kids (4 and 1) are in the blue and yellow neoprene life jackets from WestMarine. We have many life jackets for both boys, but these fit the best. The crotch straps don’t fit funny, and because of the way it’s made, the infant life jacket still offers my youngest a lot of mobility, something I find that doesn’t happen with Stearns or cheaper life jackets. They’re pricy ($55), but it’s not an option for us. They’re they best. You live on a boat?! You know that’s mine and David’s dream right?! I know you said 30% of the time, but still, so cool. Where is your boat? And thank you so much for the suggestions and I will look into them! Love your kombucha! I’ve made several batches but can’t get it fizzy for the life of me. I’ve found the secret to the fizz is in the second fermentation in an airtight container for a couple days! Oh and a lot of trial and error 😉 I’ve had plenty of flat kombucha too! My favorite is Spicy Tuna roll…so good! Now I want sushi and a scorpion bowl! Happy Easter! 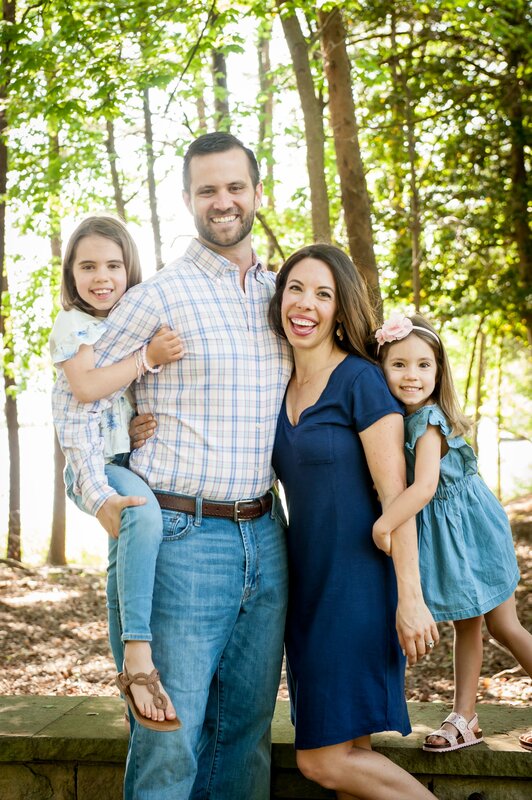 Enjoy the warm weather and time with family! 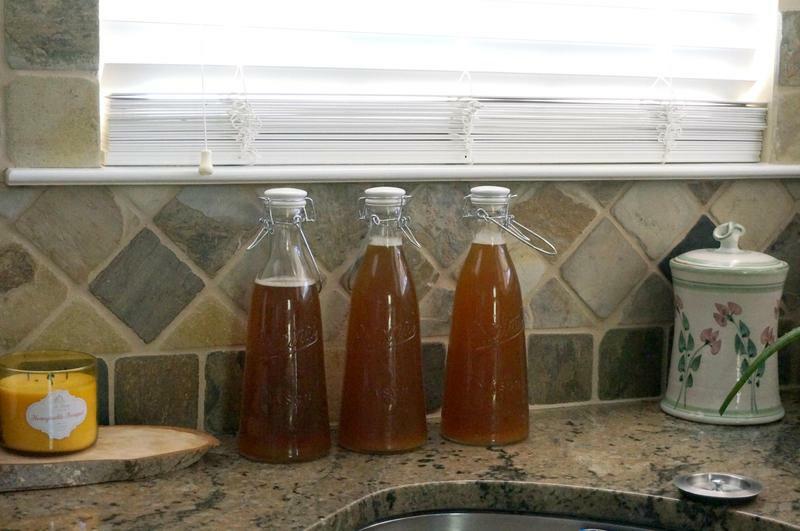 Would love to know more about kombucha–how you make it, why you make it/health benefits etc. love your blog, read it every day! It’s so much easier than you think! Are you local? I could give you one of my SCOBYs if you are interested in brewing yourself! I love it when the farmers market open-so many beautiful veggies! We never go out for sushi, but California roll, hands down is my favorite! I need to get a scoby and some kombucha in my life. Happy Easter! Prawn tempura and avocado roll any day! 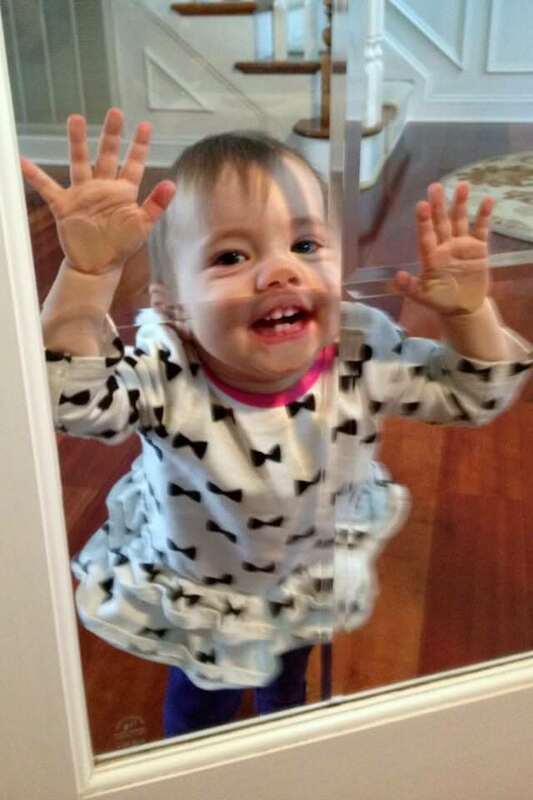 I have been following you for quite some time now Brittany, but I still get giddy every time I see a smiling picture of one of your darling girls! That one of Hailey got to me.